What a couple of weeks it’s been!! 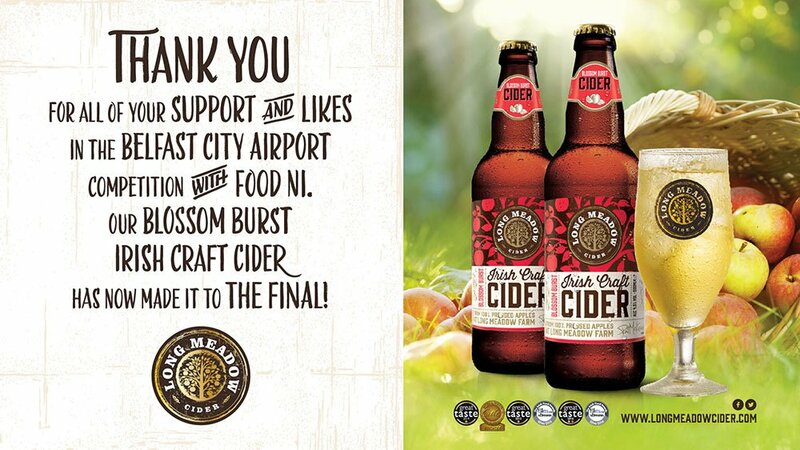 We entered our Blossom Burst Cider (An elegant, mellow craft cider bubbling with notes of sweet orchard fruit giving it a persistent, rich zest) for the Belfast City Airport Competition with Food NI. This competition offered a fabulous prize of £30K of free marketing support and brand visibility at the airport. We were shortlisted alongside other great food and drink producers from various council areas to take part in the next stage of the competition. A product image from each producer shortlisted was uploaded onto the Belfast City Airport page, those producers who received the most likes for their product would be entered for the final stage of the competition – a tasting session hosted by the airport with a panel of food and drink experts. We are delighted to announce we have reached the final stage receiving over 2K votes. This is all down to the support and help from family, friends, customers and everyone who liked, tagged and shared our Long Meadow Cider Blossom Burst image. So major thanks to you all for your continued support, without which this would not have been possible. May is a beautiful busy month, the blossom is out in full force and the bees are working their magic. Hopefully we will see some of you at the various events we are exhibiting at in May (there’s quite a few). Cheers to each and everyone of you, relax, unwind and enjoy a cool, refreshing glass of Long Meadow Cider.